I was walking with Bharathi and Vishali on West Car Street. We had just gone sari-shopping and Vish had paused to look at the bangles at one of the shaded market stands lining the west gate entrance to the temple. The sweet smell of guavas oozing with juice in the midday sun permeated the air around us. We had nowhere to be for a few hours, and this rare moment of lingering felt slow and satisfying. The hair on top of my head felt shockingly hot to the touch as I adjusted the jasmine in my braid, drawing a few damp strands off of my forehead and back into some attempt at order. As we looked through our purchases from the sari store, talking about color, fabric and style, Bharathi suddenly asked me, – Susanna, which is your favorite God? Standing yards from the entryway into one of the world’s greatest Shiva temples, which I had just traveled across the world to visit for the third time, there was no question – Shiva Nataraja, I said. She paused and looked at me. I wondered what she was thinking. But Jesus? – she asked – He is yours. Don’t you love Jesus? Surprised, I said –Yes, Jesus is great – I love Jesus. This was so inexplicably funny to me that I started laughing. Then I clarified – I love Shiva AND I love Jesus. They’re both good. And you? Bharathi said – Me? I love Shiva – and she touched her heart. I said – Oh, yes, Shiva… and touched my heart as well. Then she laughed too. The three of us purchased some bangles, bobbypins, and sari clips, then hailed an auto-rickshaw to return to the Hotel Saradharam for lunch. We climbed into one of the two white vans outside of the hotel, and I eased myself into the cool air-conditioned seat just behind the driver. 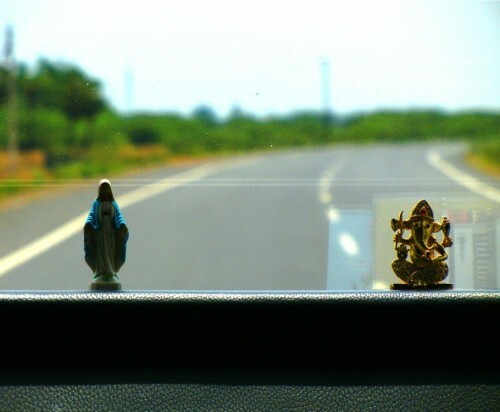 As everyone settled in around me, I looked at the dashboard, which was evenly ornamented with two little deities: on the right, a shiny gold-colored Ganesha sat cross-legged, and to his left stood the Virgin Mary, gracefully draped in blue robes. I loved seeing this juxtaposition just a few days after my conversation with Bharathi. I pointed to the dashboard – You like Mary and Ganapati! – I said to our driver – Me too! He said – Yes, yes – Mary and Ganapati! Very good! Then, because we had exhausted his English and my Tamil, which doesn’t go beyond Hello, Thank you, and ordering food, we smiled at each other as he began backing the van out into the street for our ride to the Subrahmanya temple in Swamimalai. I remembered how, when I was here in December, every roadside restaurant seemed to have a crèche, or manger scene, with lots of rainbow-colored tinsel, Merry X-mas banners made of shiny cardboard letters, and sometimes strings of blinking lights. Somewhere in the vicinity there would be a Ganesh or a Subrahmanya, Ganesha’s warrior brother, who is particularly popular in Tamil Nadu. There didn’t seem to be any conflict or contradiction in the two different belief systems being simultaneously acknowledged and celebrated, and there didn’t seem to be any attempt to separate them. On the contrary; the Christian figurines were mixed right in with the Hindu ones. Everyone was invited to the party. It’s a funny thing to fall in love with a set of traditions that aren’t yours by birth or by culture. I find myself constantly asking myself why the Hindu Tantrism that I’ve spent the last decade studying with my teacher Dr. Douglas Brooks resonates so powerfully for me and makes so much sense to me, offering such beauty and richness that I cannot imagine extricating it from my everyday thinking and way of being in the world. Unlike the Catholic churches in which I grew up, the Shiva Nataraja temple in Chidambaram is not geared toward one particular group of Hindus with a specific set of codified beliefs. Imagine a Jesus church designed to accommodate every conceivable sect of Christianity, as well as anyone else who happens to think that Jesus is cool. This is the surprisingly inclusive paradigm that we step into when we come to this temple. I love the fact that I am not forced to choose here – that it is as ok for me to be as inclusive as I am selective. Because I am an outsider, there is a curiosity about why I am here, but never a critique from any of the people with whom we interact. Part of this may be an effect of language differences, but it honestly seems to be a non-issue. The Dikshitar priests never ask us what we think or believe, even inviting us into their home. The other visitors to the temple are generally accepting, friendly, and sometimes entertained by our presence here, the women patting us on the shoulder and saying Super-good! when we wear saris. It seems to be accepted that if we are here, Shiva means something to us. Our showing up is explanation enough. In class, I tell my students that the names of the gods are names for different aspects of our selves. When we talk about Nataraja, we are talking about an amalgamation of concepts that comprises our identity. When we look at Nataraja, we are looking into one of those endless reflecting mirrors in which we catch glimpses and slivers of glimpses of our limitless selves. The complex cosmology of Nataraja reminds us that we are dazzlingly diverse. We are additive rather than reductive, like a cubist painting that reveals infinite perspectives from a single vantage point. We are multiplicity itself.